"Originally from Liverpool, I have always been a professional artist, the first part of my career as an illustrator. After studying 3D Design at College in the 1980’s I am self taught in acrylics and watercolours. My paintings are impressions of the subjects, I paint instinctively and freely and will sacrifice precision for atmosphere. You can often find me painting in Pier Lane Gallery, Arnside, which I run with my wife Caren and our friend and colleague Trevor Brown. We are open all year round and daily (apart from Christmas day ! ). In my larger paintings, I like to hide a little ‘heart’ symbol, some are more obvious than others. See if you can spot them ! " Jean is a local Wildlife Artist based in Ireleth , Askam in Furness .She was trained as a Scientific Illustrator at Blackpool Art College and this is where she developed her eye for detail. Her Uncle and godfather the late Artist T.Leslie Hawkes encouraged her detailed work when she was young and often gave her painting lessons. She has worked in various locations doing Arty things including a pottery company near Poulton le Fylde designing the transfers for the China. After putting her Art on hold to bring up her daughter she decided to get back into what she loves about 10 years ago. She exhibits in her local art societies and regularly exhibited in the National Exhibition of Wildlife Art and The Lakes Society of Artists. Her Originals go all over the world as well as her Limited Edition prints. 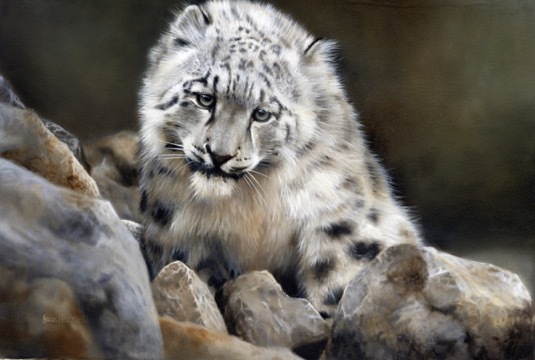 Jean has been in the finals of the David Shepherd Wildlife Artist of the Year twice now and exhibited at the Mall Galleries in London. She also exhibits regularly with the Association of Wildlife Artists and won their Best British Wildlife Award as well as their Childrens choice award. Last year she started exhibiting at the Exhibition of Wildlife Art on the Wirral , a place for all the top wildlife artist to exhibit in the North of England. She does a fair amount of pet portrait work which are commissioned from all over the world and are booked a year in advance . Her passion is painting a moment , a highlight, a look , in the wonderful world of wildlife. William H Jones was born in Bolton, Lancashire and studied Graphic Design at Bolton College of Art and Design, graduating in 1973. Since then he has sold works in a variety of media, from watercolours, to pastels before settling on his preferred medium of oils. As a professional artist painting predominantly in oils, he has been based in Cumbria for the past twenty nine years. The beautiful scenery that surrounds him acts as inspiration for his work. With an established reputation in landscape and portraiture painting, William and his wife Bernadette ran the successful Finestra Gallery in Kirkby Lonsdale for fourteen years, and have now opened Williams home studio as a gallery at Dairy Cottage displaying solely his own work. He was elected president of Kirkby Lonsdale Art society in 1997, is a past president of Kendal Art Society and has exhibited for many years in open exhibitions across Lancashire, Yorkshire and the Lakes.